As I ate the breakfast of the month (or, umm months) this morning at work; a co-worker proclaimed “you eat the same thing ALL the time”. Apparently that is a bad thing in their eyes. What is this breakfast you may ask? Just the most delicious and easiest to whip up in the morning before work recipe! 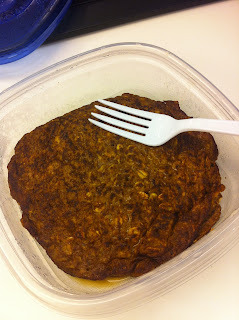 Chocolate pumpkin oat pancake FTW! I know it may not look like much, or perhaps appetizing at all, but the thought of this divine pancake has me salivating for breakfast every day. And, SO easy to make! Cook like a pancake and boom you have a fabulous fall breakfast. Obsessed. I honestly think I have eaten this every day for a couple of months now. And, perhaps some lazy dinners as well. I am not embarrassed one little bit by this fact. I am a creature of habit. And also when I find something I like I stick with it. In general I am a very “boring” eater. I’m not one of those people that gets excited about the new restaurant or a new cuisine. Dinner dates are a waste at a fancy restaurant are lost on me and I will not appreciate the cost you are spending on something that is supposed to be THE BEST THING I EVER HAD. Case and point: I had literally 2 bites of the meal at the Waldorf on Monday night. Filet mignon? Deconstructed brushetta? Pffftt I couldn’t wait to get home and dive into a container of roasted brussel sprouts! I have a very sensitive stomach. I haven’t actually taken the time to be fully worked up or diagnosed with anything but I know (for the most part) what will and will not upset my stomach. I have sadly given up most dairy for this reason a true love of mine but I would prefer to not be running to the bathroom versus eat cheese (if you have read some of my running posts my bathroom woahs are well documented). Sure I get food cravings and urges (I have a weakness for all gummy candies and nut butters) but the majority of the time I am able to stop and think about it. Because I have a propensity to overeat if something is “bad” and also eat out of boredom I try and take emotion out of food. I find food prep is what works best for me. A couple of days a week I cut and roast a ton of veggies (squashes, carrots and brussel sprouts are the items of the moment) bake or grill my proteins – usually chicken breasts, chicken sausages and ground turkey and then cook up some quinoa and couscous. Mix and match and easy to grab, nutritious meals all week long. Usually if I have a craving I have worked out too much and eaten too little or my macro’s are out of wack. I absolutely enjoy my veggies. Seriously I have to stop myself often from eating TOO MANY. Especially the roasted variety. A big pan of roasted winter vegetables is dangerous with me. My latest kick is steamed cabbage. I do not know how I went this long without eating it, but all I can say is obsessed…and sorry everyone that lives in my building how stinky it can be cooking! So yes, I may eat my oatmeal pancakes for breakfast every day, and it may look boring but I swear try one yourself and you will be wanting one every day as well! Or so that is what I will tell myself! I tend to eat the same breakfast everyday. Boring, but I love it.